Are you aware of the fact that there are currently approx 3 million Android apps in the Google play store? How would you make your app stand out from such a big pool of applications? If you want to be successful with your development process, you have to look for a way to differentiate from other developers. You can do it easily by marketing you apps so that users can easily find your application. Don’t worry! It’s not that hard to be the one among millions of other apps. You just have be different in your marketing strategy and try to innovate with new idea that other 95% of app owners have not done. This article is for those who are willing to come up in the Play store and want to get notified from maximum users. Here, I have shared some of the simple yet powerful tactics that create a buzz in the market. You need to ensure that your app then your word of mouth will do the other work. Word of mouth is something that don’t need any marketing. It’s basically the content of what you proffer. For example; consider a movie that has a great storyline and everything that the audience wants. It will automatically be popular among everyone. Same can be applied to your app as well. The more people will talk about your app the more your app will get hit on the downloads. Usually, people prefer to read a review of your app; so the content and functionality of your app is the prerequisite for any app to get higher downloads. If you are tight on a budget and want to promote android apps on a less investment then social media is your cup of tea. With adopting this strategy you can reach out to a wider audience. Not only this but you can also garner a new audience as well. Organic promoting of Android apps come through making an account on all the social media platforms. You can start your posting on Facebook, Instagram, Twitter, and other platforms. One thing you need to keep in mind is that make sure you don’t spam people with your post. These platforms are so smart that they will know when you are spamming and when you are genuine. Looking at the pace of the click-through rates it is worth trying to promote your Android apps and make it more discoverable. In the mobile app world, app store optimization is trying to bring your app through some keyword research and other important tactics. It is the SEO of Mobile app stores. What should you keep in mind while doing ASO (App store optimization)?  Keywords - use relevant keywords and use it in the description, don’t stuff the keywords.  Description - articulately write your application’s description. Write what is unique that your app provides. Add features and beautiful screenshots that catches users attractions.  Ratings -keep an eye on your app’s rating. You can create your app’s one-page website from scratch or make HTML template but it is better to hire a Wordpress developer to have a one-page website. Add excitement, energy, enthusiasm to your video and try to attract the customer and create curiosity Gap to download your application. Paid techniques also play the biggest role in social media advertising across Instagram, Youtube, Twitter, and Facebook. 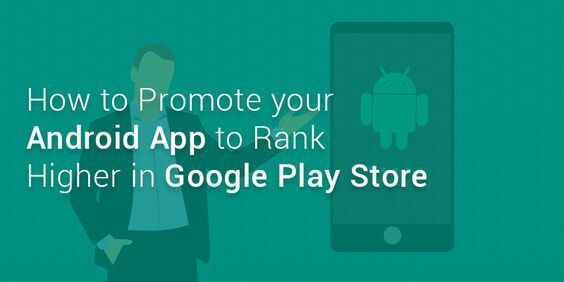 The sky is the limit when it comes to the ways to promote android apps. You can think your app launch as a product launch and work on the strategy to elevate your download numbers. Don’t forget to ignore any of these tactics. In addition, if you want to make it more organized then you can approach for an experienced mobile app company. What are your views on promoting android apps? Paresh Sagar is the CEO of Excellent Web world, IoT, Web and Mobile App Development Company that helps startups and enterprises to enable mobility solution. He’s an avid blogger and writes on all the latest technology trends.